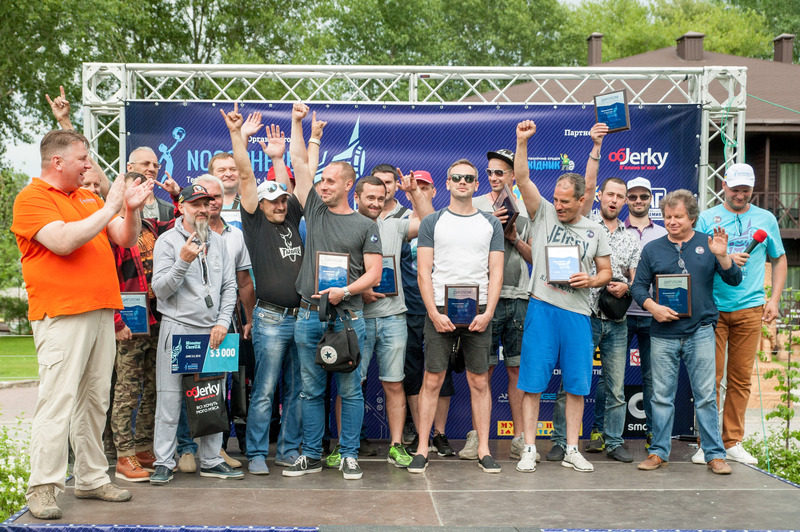 The first weekend of June has traditionally been a date for the largest tech event in Dnipro — BestRoboFest. 2018 was the 3rd time Noosphere organized a festival to promote robotics and technology. To attract more guests and create a summer atmosphere, BestRoboFest was moved to a new location this year — Bartolomeo Best River Resort. The location was divided into several areas. Visitors were able to explore the world of science via exhibitions in this zone. Guests visited the planetarium, robotics workshops, experiment tables, photo areas and a place for art with boards and paints. Children could even get an ink BestRoboFest logo tattoo. This part was also memorable for the Firefly Aerospace photo area, where company representatives showed off miniatures of their Alpha and Beta space rockets. Visitors were also able to enjoy the central exhibit at BestRoboFest — a 6’1’’ tall humanoid robot called Dobrobot. It was equipped with a cash receptacle for people to make charitable contributions. On the second day of the festival, Dobrobot was officially ranked as the largest charity robot in Ukraine! He wasn’t the only robot at the festival. 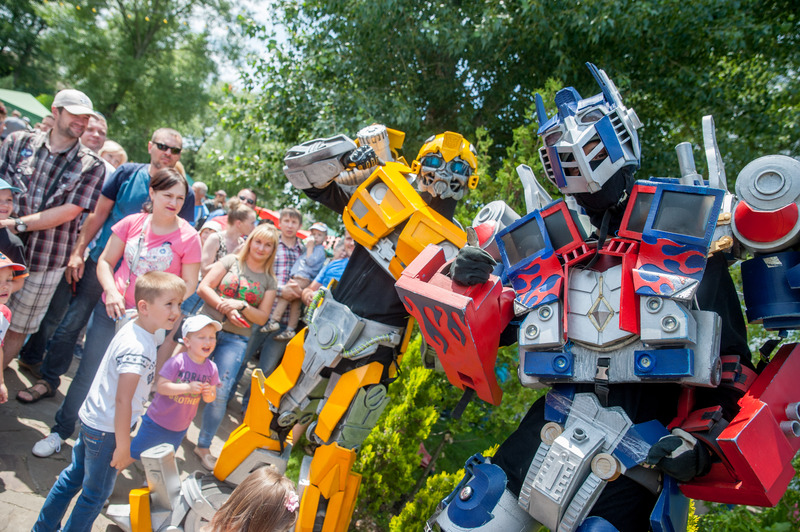 Visitors took hundreds of photos with mobile replicas of Bumblebee and Optimus Prime from Transformers movie. This is where visitors were able to enjoy flying copter shows. Professional pilots from the Copter Race team demonstrated copter stunts in the air. Visitors were able to wear a special helmet to see the track from the camera view on the drone. Unlike previous years, there were no copter race competitions at BestRoboFest, but that’s OK, because we’re holding a stand-alone event for copter races this Fall. Traditionally, the monster vehicle exhibition, MonsterCarsUA, has taken place as a part of BestRoboFest. 21 monster vehicles took part in a two-day exhibition positioned near the gates of the festival. The judges, which included our co-founder, Michael Ryabokon, and automobile industry journalist Larisa Maksimenko choose the 3 best participants and awarded them with trophies, certificates and cash prizes. The MonsterCarsUA winners and participants were awarded their prizes on Sunday, June 3rd. This is a creative programming competition, where participants needed to create a game using the Scratch or S4A environment. This year projects needed to be on space exploration. The judges included Noosphere CTO, Yury Letser, and Dnipro University tutor, Tatiana Bulanaya, chose the three winners. 3rd place — Serhii Derevianko from Dobrovelichkivka. 3rd place — Victoria Hubar from Dobrovelichkivka. 2nd place — Ihor Sopin from Zaporizhya. 2nd place — Head Works team from Dnipro. The name of this competition also speaks for itself. Participants brought their ideas to life and presented them to the judges of DNU and the Noosphere Engineering School tutors. No limits, no rules. Just dedication, creativity and technology. Participants were divided into two age groups: Juniors (0-14 years old) and Seniors 15+. Free Style Juniors: RoboHouse team from Kherson with WAF project. Free Style Seniors: Student team from Cherkasi with Bio Prothesis and Robot-Artist projects. People’s choice Free Style award went to Robot School team from Poltava for their Smart House and Medieval Fortress projects. All the winners were awarded cups, diplomas and prizes. The competition among the first June weekend family events in Dnirpo was very high. One of the main roads to the festival location was also blocked due to a triathlon. Despite this, BestRoboFest 2018 managed to attract more than 25,000 visitors over two days. We are happy that Noospherian ideas found reflection in the minds of so many families. We are planning to keep the tradition going by holding the next BestRobobFest on the first weekend of June, 2019.